MELBOURNE, Victoria -- Les Heintz (Springvale South, VIC) has put his name on the Rowe Memorial Super Stock trophy once again with victory on Sunday in Round 6 of the Summit Racing Equipment Sportsman Series at Calder Park Raceway. Joining him in the winners circle were Craig Geddes (Competition - Miners Rest, VIC), Adam Murrihy (Supercharged Outlaws - Karama, NT), Jason Stares (Top Sportsman - Camden, NSW), Matt Forbes (Modified and Super Gas - Ballarat, VIC), Joe Bresciano (Super Sedan - Epping, VIC), Matt Allan (Modified Bike - Bayswater North, VIC), Garth O'Hehir (Super Street - Knoxfield, VIC) and Eden Ward (Summit Racing Equipment Junior Dragster - New Beith, QLD). Previous Rowe Memorial winner Heintz qualified fourth in the seven-car Super Stock field then defeated Ray Oxley and Daniel Camilleri for a birth in the final. 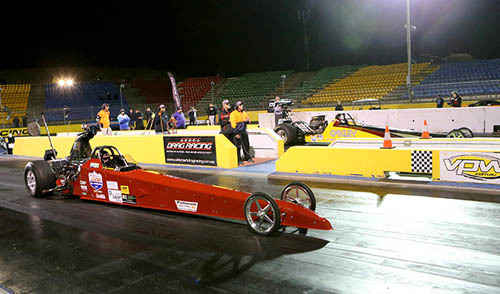 There he defeated Mick Simic who fell asleep at the tree with a .410 reaction time as Heintz claimed victory with an 8.577 second pass on an 8.66 index to a 9.218 on a 9.39 index. "To win it for Andrew (Rowe), keep it in Victoria and bring it back to Calder Park where Andrew was just a great competitor, it was just fantastic," said Heintz. "Knowing him personally I know he would have been very happy. I'm very luck to have won (the Rowe Memorial) more than once. "We haven't raced the car for six to eight months and I was a little bit rusty - it took a little bit to get used to again. With the new surface at Calder and getting the car to adjust to it, we worked reasonably hard on it. "I've got great crew people, great crew chief and some very special people that give us a hand." In Competition Eliminator, Craig Geddes kept up his recent run of form reaching his fourth final in as many events contested this season picking up a third ANDRA Christmas Tree in the process. Geddes had already taken the Trick Flow Top Qualifier then dispatched Mike Nola in Round 1 followed by an engine saving bye in the semi final. Against Shane Baxter in the finale, Geddes had the reaction advantage and never looked back covering the 1000 feet distance for the bracket at this event in 6.243 seconds on a 6.39 index from a 5.655 on a 5.86 index. "It feels terrific, we're really enjoying our racing and we're passionate about ANDRA Drag Racing and the Summit Racing Equipment Sportsman Series," said Geddes. "We've got a good car, a good combination and an index that is probably helping us at the moment. We're just nibbling away at that - we can set the record and continue to do that as we're working over the eighth-mile, 1000 feet and quarter mile tracks so there is plenty of scope there for all the records. "We can put down some good runs when we need to, we're still learning the car and the five speed is an interesting thing but that car being so light, and it doesn't have a lot of power, so if you mess up it's still fast." Six weeks ago in Portland Matt Forbes became the first Sportsman racer to win two ANDRA Christmas Trees in one event. He can now lay claim to being the first driver to achieve the feat twice and in the same season with another Modified/Super Gas double. Forbes first defeated Darryl Stephen on a holeshot in the Super Gas final with a near perfect .002 reaction time to lead all the way in the 9.90 fixed index class on a 10.279 second effort to a quicker but losing 10.267. He then set on an Olympic sized dash back to the staging lanes to pilot his Modified dragster on a drive around victory over Kenny Stewart with a 7.579 elapsed time on a 7.32 dial in to Stewart's 7.847 second ET and 7.49 dial in. To reach both finals Forbes defeated Super Gas number one qualifier Anthony Panetta in Round 1 and defending National Champion Graeme Spencer in the semi final. In Modified the history making all rounder defeated 2014 Champion Shane Wynd for a solo in Round 2 before sending Neil Dyson packing in the semi final. At the beginning of the month Jason Stares claimed his first ever ANDRA Christmas Tree in Top Sportsman bookending December with a second consecutive victory. Stares qualified second and rode his luck in Round 1 when Andrew Darby turned on the red light before receiving a second round bye. When Stares needed to be good, he was very good reacting quickest against number one qualifier Darren Saliba for a big semi final win and then taking out 2015 Championship Runner Up Stuart McBain on a 7.402 second pass on a 7.29 dial in from an 8.080 and 7.95 dial in. Supercharged Outlaws became a war of attrition as one team after another suffered breakages ultimately leaving first round winners Adam Murrihy and Justin Russell to face off in the final. Murrihy reacted slowly at the start line and coasted the length of the track but Russell had already jumped the gun with a red light by .006 seconds handing the win to the Territorian. Russell stayed on the gas the entire 1000-foot distance then inexplicably turned sharply to the right, bouncing off both walls and turning over on his lid through the breaking area. Thankfully Russell was out of the car immediately and cleared by medics on site however his Chevy was not so lucky. Joe Bresciano claimed victory in Super Sedan when he defeated Enio Morrocco in the final with a 9.199 ET on the 9.15 dial in from a 9.403 and 9.34 dal in. 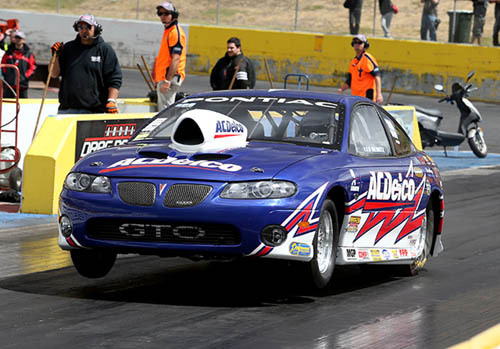 Bresciano had earlier received a bye in Round 1 then eliminated top qualifier Benny Phillips in Round 2. He then defeated Chris Theo and three-time Champion John Kapiris to march into the final with some swagger. Matthew Allan was made to do it the hard way in Modified Bike even though he qualified second and received a solo pass in Round 2. He first defeated Championship contender Don Baird in Round 1 followed by Johnny Ireland in Round 3 and perennial Championship challenger Edgell Mallis in the semi finals. Allan was rewarded in the final when Wayne Odgers red lit opening the path to a casual 9.402-second victory lap on an 8.90 dial in. Garth O'Hehir overcame Peter Jephson, David Brae and top qualifier Anthony Barbara in Super Street then benefited from a solo pass in the semi final to set up a final showdown with Anton Krajina. O'Hehir kept his cool with an 11.584 second pass on an 11.24 dial in as Krajina fouled at the line and gave away the victory. 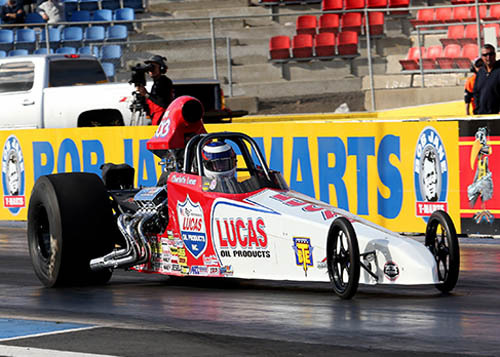 And finally defending Summit Racing Equipment Junior Dragster Champion Eden Ward bounced back from a disappointing East Coast Nationals campaign defeating Josh Baker in the final despite a slower reaction time. Ward recorded an 8.036 on the 7.97 dial in to the cross the finish line first from Baker's 9.219 on a 9.02 dial in. Ward earlier eliminated Natalie Bishop, Dylan Panetta and Michael Naylor before coasting through a solo semi final. The Summit Racing Equipment Sportsman Series now moves onto South Coast Raceway in Portland, Victoria January 16-17, 2016 for Round 7. 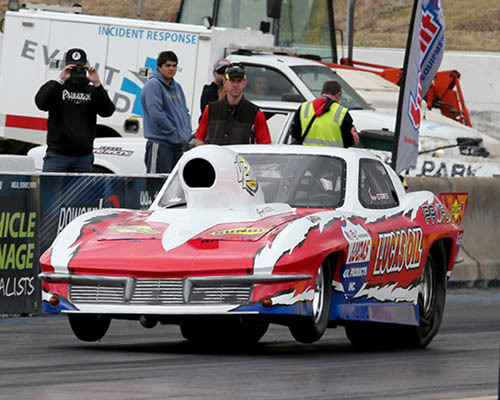 The Series then returns to Calder Park January 23-24, 2016 for the Australian Nationals. For full results from the Rowe Memorial Super Stock Classic, please click here.